* Two of my small scale pieces have been accepted in the Durham Art Guild juried show, which runs from Nov. 20-Jan. 22, 2010. The pieces are Tinbrella (for people who REALLY like the sound of rain on a tin roof) and Digital Freedom. When you're ready to have some kind of phoenix garden/sculpture created in an open field--call me. My work on this piece was featured in the Herald-Sun. 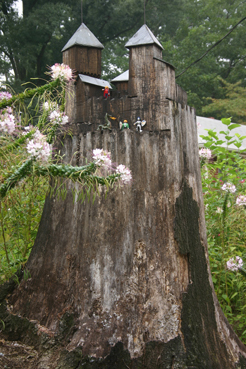 It's called Castle Oak and kids in the neighborhood decorate it with their toy knights and dragons. Adults bring their out-of-town visitors by for a look. 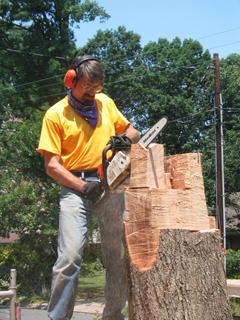 I'm about to start work on another tree sculpture in Duke Park as a gift to the neighborhood. (upstairs from the old Palms Restaurant) where I put together smaller scale "table top" pieces, such as "Waiting for Bastille Day" and "No Time for Old Time, I Scream". In the future, you will find pics of my work here. Contact me at fincaminor@mindspring.com to get pics and learn more. Free Fido--a temporary installation by my wife, Chris and I, at the traffic circle in Duke Park neighborhood. 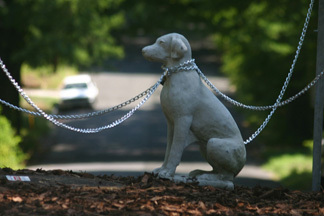 The piece is a protest against the practice of chaining dogs for long periods.